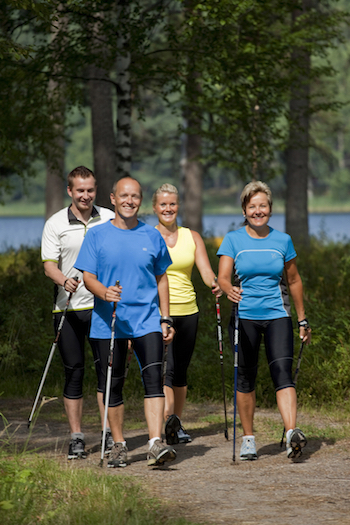 Nordic Walking East Anglia run classes in a number of locations. Our classes are currently held in the Clare and Bury St Edmunds area and we also teach privately around Newmarket and Haverhill. Regular walks take place during term time and are led by a Nordic Walking East Anglian Instructor. You must have already been taught how to Nordic Walk by a qualified instructor before joining one of these sessions. If you are new to this sport and would like to learn then please click here to read about our beginners workshops. If you feel you would benefit from a refresh on technique before joining in then please contact the instructors directly. Instructors will provide Nordic Walking poles. This is the perfect class for beginners and those who prefer to walk about 2-3 miles/hour. The focus of these classes is on perfecting technique, whilst enjoying the beautiful surroundings of the Suffolk countryside. This class is designed to work on fitness levels by walking at a pace of 3-4 miles/hour per hour. This class will include strength, balance and cardio-vascular exercises. Walking for Sport is aimed at those who are walking at speeds of 4-5 miles/hour hour and want to incorporate Nordic Walking into their overall cross training programme for fitness.